So with that, I am going to write a blog post. About nothing. I feel like every time I sit to expound some grand idea into a post, it never gets finished, mostly because it leads to other tangents. My latest attempt, for example, is to pictorially represent the California Coast from peak to ocean, but it cascaded into my fight with Lightroom catalogs [turns out, my backup drives weren’t copying the lightroom edits!]. So, instead of doing all that for the time being, I present to you two sunset shots for your meditative pleasure. I feel better now. You often here people proclaim that the weather in their hometown takes the cake for being the most extreme. “If yaw dawn’t liiike ther weathur, jus wait fu’minnits—ittel change!” [the hybrid southern accent some people in my hometown like to emulate]. Oddly, I’ve personally heard this proclaimed in at least 5 states. Here in California is one of the few places where the weather is the most consistent. Temperatures right along the coast aren’t extreme; it will rain for days, be sunny for days, and be foggy for months! Those border days are pretty interesting though, and serve to remind that change is the only constant. Yesterday was a chilly 40 degrees with a dark grey fog smothering out the Sun on the coast. Briefly in the afternoon, a slight hint of yellow appeared and vanished, marking all of what would be seen of the Sun that day. The day before, sunny and relatively warm [upper 40s, and yes from 40 to upper 40s is a big difference around here!]. Today there is a pink glow in the East, what appears to be a milky blue above, veiled in the little fog that lingers [And…by 9:30 the fog buried the Sun once again! Come on now, this isn’t Summer!!]. Cloudy days are perfect for editing photos; sunny days make it hard to see the computer screen. Since today is a sunny day, I try to rush and get computer things done before heading out to walk the dog. This photo was taken three days ago. Had you checked the forecast on that day, you’d find no mention of the arrival of the summer-like fog to the coast. Lurking offshore, fog rarely gets to visit the coast in the winter, so its surprise appearance probably helps with additional coffee sales for the day. While the weather isn’t the most dramatic in the world, it does make for some really interesting phenomenon. For example, I recently googled how to prune back geraniums. None of the examples looked like the monster I wanted to tackle. This geranium has obviously lived at this rental for years and years, becoming a gnarly small tree with the occasional flower and leaf thanks to the lack of hard frosts. 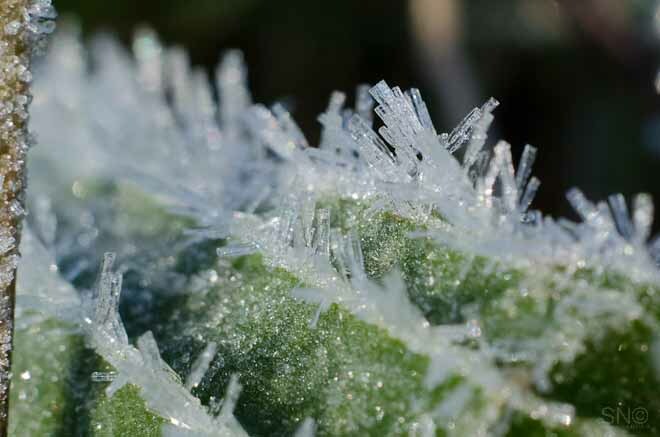 In fact, finding frost is often like finding treasure. Most often, I can find a little on the colder mornings in the fields, but it often quickly gives way to dewdrops before 8:00 am rolls around. A leaf bud of a currant taken a couple days ago. Frost in the meadow before the sun hit it, taken the same day as the leaf bud. Even though I do miss inches of snow, crazy lightning shows, rolling thunder, and the occasional tornado chase, this area definitely offers some interesting weather quirks in its own absurd, North Coast way. We found ourselves in our oldest car, since our newer [read, not near two decades old] one has wheels that are too big for snow chains. Pondering whether we could safely make it to Crater Lake, we settled on the idea that if we couldn’t, we’d just go as far as possible, maybe settling for Redding or Mt. Shasta. Of course, I was really looking forward to seeing Crater Lake in the snow with a calm, reflective surface. Snow was definitely around, but luckily by the time we hit Interstate 5, chain restrictions were dropped along our route. We went along Highway 97 up to Klamath Falls, dropped stuff off at the hotel, rented snowshoes [nowhere in town had any to sell! ], and headed up to the lake. By that description, it sounds like we rushed to get up there. According to Google Maps, we didn’t. It was an all day excursion in which the scenery threatened to enchant and ensnare me before reaching our destination. We arrived just in time for the tail end of sunset. It would be the only day we could clearly see the lake, so we braved the cold and hung around at the rim by the Lodge. Surprisingly, there were a fair amount of people up there for the middle of winter. Even a happy puppy ran around in the snow. Deciding to brave not only the cold, but the wind that was howling down into the caldera, we tried for some nightshots. Unfortunately, shielding the camera and tripod from the wind yielded no good results [nevermind the fact that I am not able to focus in the dark at times]. I still have a bit of a learning curve with the new camera as well. You can see a plane in the photo above! There were so many flying over that night–the jetstream must have been just right. I really like what the high thin clouds did to the stars in this shot. I’m not sure if that’s a plane, iridium flare, ISS, or meteor on the left. The next day, when it was just a little lighter, we snowshoed a few miles out and back. It snowed as we traversed the rim, filling the previous passerthroughs’ tracks. It was as if we were the only ones there. On the return, ski-strapped folks and a few snowshoers headed out. We ended up ON another lake the next day, since the weather repeated its gloomy self. We had a lucky break and found some sun, fog, and a nicely frozen lake. With such a short window to visit, being flexible with locations and weather worked out in our favor! Many more photos to share from this trip! A sunset the other evening yielded a smoky end to the day. We guessed that the smoke was from fires in Asia, but we weren’t sure. The tide was low and the waves small; the beach had more of an Atlantic feeling to it. The 60 degree temperatures on the coast were the main hint that it wasn’t the East Coast in July!